Conference report - Mini-Conference in Moss! - Judging in the North!Judging in the North! And thus started my plans for putting together a mini-conference in my hometown, and why not share this with the judge-community? 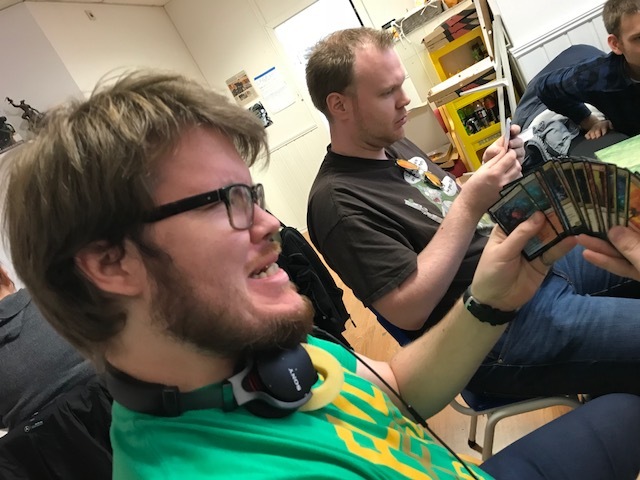 Sit back and enjoy the ride for what is my report for the mini-conference in Moss 27th october 2018. I remembered copying the plans for holding a mini-conference from our old regional forum to this blog some time ago, so my immediate action was to check out that article. I had applied to the Hyperion association for funds, and was allocated 5800,- NOK (approx. 600 EUR). This was my budget to have a meeting room, lunch, drinks, pizza and free draft for the participants. Mind you I’m living in Norway, so things are as expensive as they get. Sign-up for the conference was really slow at the start, and I was worried that I couldn’t reach the goal for minimum attendents (10 certified judges). I tried to spam the channels available for me and contacted several judges on PM, in the hopes of getting the numbers up. Luckily the conference got a large number of applications the last days before deadline and I was looking at 17 judges and some number of uncertified people interested. When I booked the meeting room at the school I was aiming for 14 people. Now suddenly we were about 20! I checked with the school and we should be able to fit 20 people in the room – even though it was a bit tight. The next thing that was going slowly was judges interested in presenting. It took several reminders, but we made it with 4 presenters including myself. I felt we got a good mix of interesting seminars, so I was looking forward to see what they produced. Even though every presenter failed to keep to the deadlines, we got there! My RC had ordered the conference foils, and the shipment was put on hold waiting for invoice of the cards and was to be returned within 5 days in no invoice could be produced – yikes! Luckily, the well-oiled machinery of the Judge Program solved this unforeseen happening very fast, so the participants could get their foils for attending. The day before I ordered lunch for the participants- baguettes with chicken tandoori. OK, all set – here goes! The day started with picking up the lunch, then I headed down to the meeting room 1 hour earlier than the start. One by one, the participants entered the site and I kicked off things with a short introduction and the first seminar. In this presentation, I first teamed up the participants in teams of 2. Then we see video-examples of different things going wrong at Regular REL and the subjects in the video calling for a judge. The teams then need to discuss within and come to a conclusion that is shared with the group. This results in discussions and laughter of the hapless subjects in the videos. After a short break, it was time for another presentation. 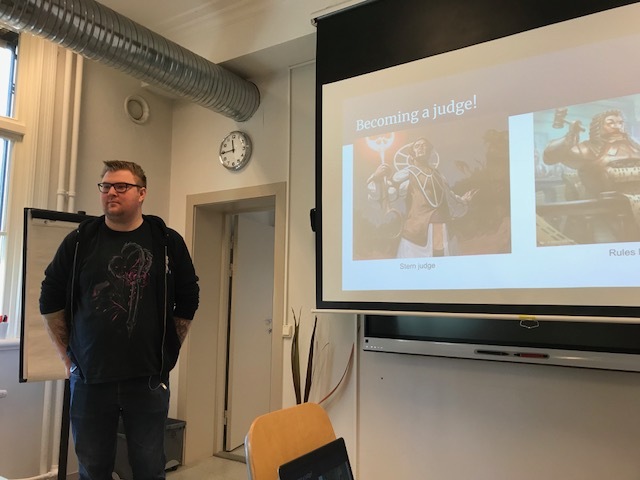 Lasse had an interesting seminar about how you should appear and behave as a judge. 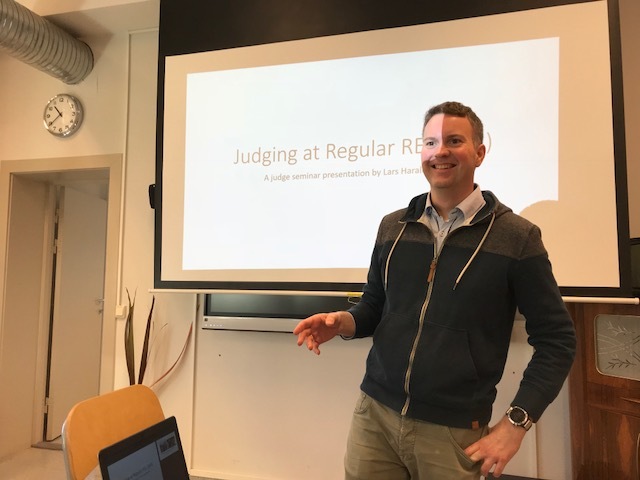 Lasse aired some ideas that ended with a lot of interesting discussions, with regards to how to be balanced in the role as a judge. After two seminars, people were hungry and everybody (luckily) enjoyed the baguettes I had bought. 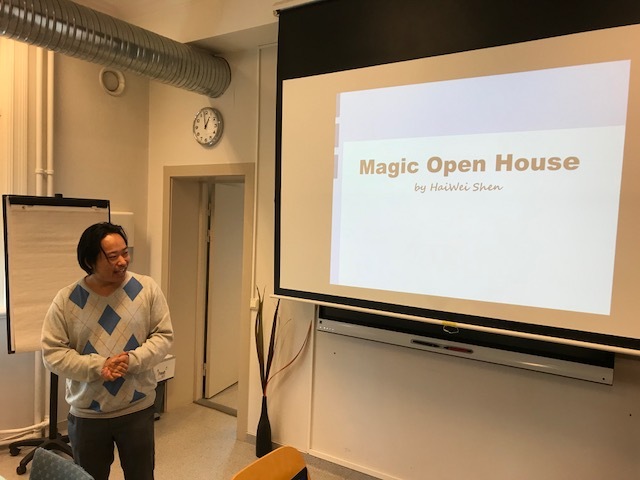 HaiWei wanted to highligt the importance of having MOH and similar events, and showed great examples of how the store he judges at performs them. He ended up sharing experience and ideas for how to improve both the event and player/judge experience. A lot of the judges realized that they could really improve on how to promote this event, and we had a lot of interesting discussions! 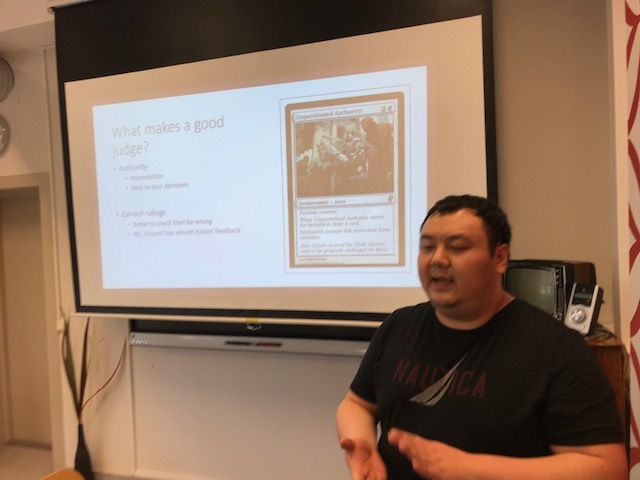 The last presentation of the day by Michael, catered to more experienced Level 1 judges and aimed to give judges knowledge on how to judge competitive REL events and how to behave. The judges got to see how we handle Missed Triggers, and where to find resources to study. After the last presentation, all participants filled out a short feedback form and got some rewards. Even though uncertified judges don’t recieve foils, all participants got some leftover Judge Tokens that I had so no one left the venue emtpy handed. With the mind full of new knowledge, it was time to get some of it into action. Well, a free draft and free pizza sounded just about right! Free pizza and draft – what more could you ask? Yes, I think you have drawn enough cards Harald. 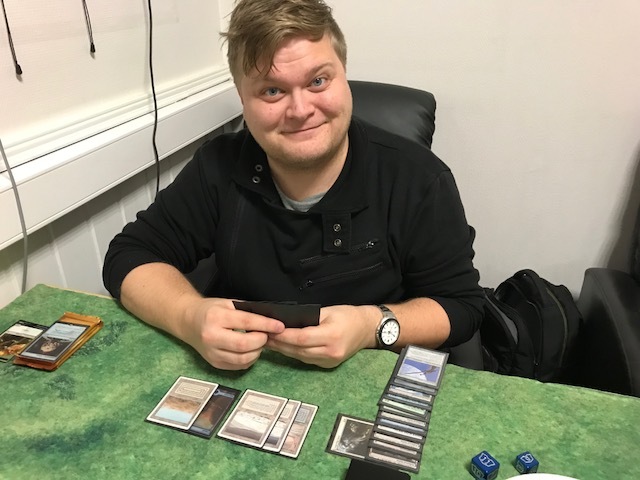 Not the actual Level 1 exam – rather a friendly game of Legacy. 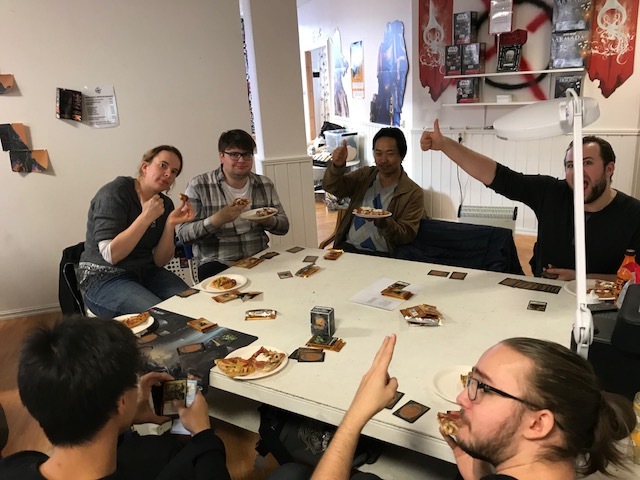 While some were drafting, others took the Level 1 exam, and Mathias Storemyr passed his to much rejoice from the rest of the crowd. Congratulations again Mathias! And that was it – my first conference planned and arranged. I must say that it was quite a lot of fun, and I got great feedback from the participants. I would love to arrange another conference in Moss again in the future.